Generous WATR Members Make the Goal! WATERSHED HUG, to everyone who chipped in, to make this WATR’s best fundraising year ever. Watch for a “Love Offering” appeal over the next couple of weeks and a launch of our 2012 Membership Year Drive in the fall. material to the Cherokee basket maker. But it’s in short supply. A Cherokee artisans group has provided a grant to WATR to locate cane stands along the river to provide a local supply for basketmakers. With a revival of basketmaking in Cherokee, artisans are having to travel farther and farther from home to find cane suitable for their use, said David Cozzo, director of RTCAR, for Revitalization of Traditional Cherokee Artisan Resources. It wasn’t long ago, said Cozzo, that the art of basketmaking had gone into decline to the point that there were only two Cherokee artisans making double-weave baskets. Supply of cane wasn’t a problem. Then the Chrokee Preservation Foundation stepped in and started basketweaving classes. A revival ensued. Now, the craft is even taught in the Cherokee High School. “With the cultural revival, the need for river cane has increased,” said Cozzo. His group is planning a trip soon to Barbourville, Ky., to harvest cane from a “really nice stand” there. And it is working with Sumter National Forest in South Carolina to find cane there for harvesting. Cozzo is convinced that there is river cane enough in Jackson and Swain counties to provide an adequate local source –it just needs to be located and the owners persuaded to allow the harvesting. That’s where the grant to WATR comes in. The grant is for $9,500 for the project, which will run through September, 2012. Roger Clapp, WATR director, has issued a call for volunteers to help with the river cane hunt. “This would be ideal for people who like to wander the mountain backroads, enjoying the scenery and plant life,” he said. Volunteers or owners of rivercane stands who are interested should contact the WATR office in Bryson City at 488-8418. Those interested in the project are invited to travel to Murphy to visit another water cane project on the Nantahala watershed. A caravan will leave from the WATR office in Bryson City at 9 a.m. Tuesday, No. 16. Bring a lunch. 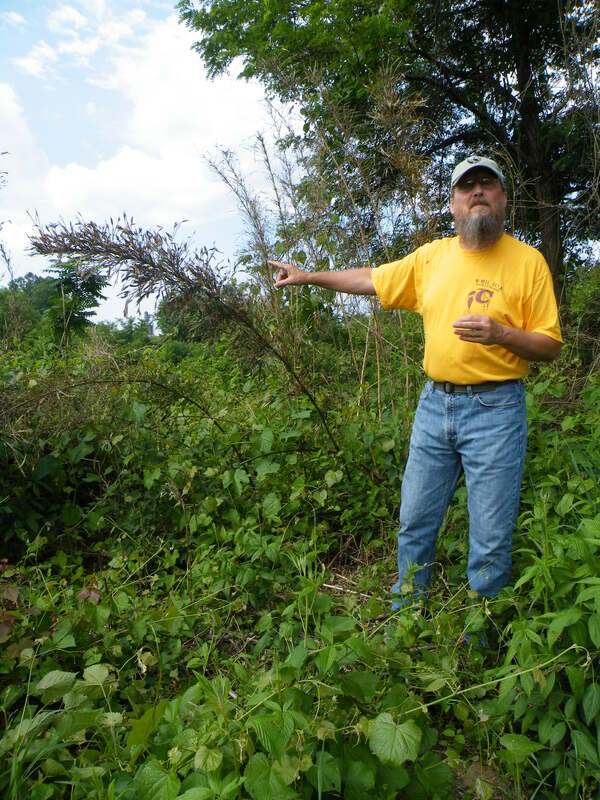 Volunteers for the rivercane project will take part in a training program to learn how to recognize the plant and how to map the site using GPS coordinates. The training zsessions will also be used to set up the driving routes to prevent overlap and to make sure the area is covered. Once the stands are found, owners will be approached to see if they will allow harvesting of the cane. Cozzo said a selective harvesting method would be employed. Cane must be of a certain size to be useful, and less mature cane will be left alone so that it can grow. Clapp said that cane stands should be preserved and broadened for the environmental benefits to the river. Cane provides excellent buffer for sediment runoff and improve riparian wildlife habitat. Cozzo said his agency likes to work with conservation groups, such as WATR, “because we’re all on the same page” – that the ecological and cultural benefits of the cane resources got hand-in-hand. Both Clapp and Cozzo said that rivercane landowners who permit a harvest will know that they are playing a role in preserving the heritage and culture of the Cherokees and the mountains. WATR recently learned that its proposed project, “Experiential Environmental Education in Dillsboro, Jackson County,” was accepted, and it will be funded by Resourceful Communities, a program of The Conservation Fund headquartered in Chapel Hill. The good news is that WATR will receive funding, the challenging news is that we asked for $15,000 and we have been awarded only $5000. First, we will create an interpretive Buffer Trail at Montieth Farmstead Park in the natural area next to Scotts Creek. Why is this so important? Stream ecology is really protected by stream-side buffers for many reasons, and builders and landowners, by and large, do not know these reasons. Second, WATR will complete a feasibility study for a Watershed Activity and Discovery Experience (WADE) Center – a hands-on learning center focused on our mountain watersheds. Dr. Dan Perlmutter is leading this part of the grant. He has already convened the first of several brain-storming workshops. So the challenge is how to do much of what is promised with less resources. The only way is to depend more on volunteer help. Free construction by crews from the Oconaluftee Job Corps is central, but we may have to look for donations to cover material expenses. Watch for a planning session at MFP in the near future.